The sugar glider, which can be described as a small, nocturnal, marsupial gliding possum—very much like a flying squirrel but from a different lineage—has been growing in popularity as an exotic pet. And as with all exotic pets, sugar gliders should be approached with a grain of salt when it comes to care. Potential owners should do much research before taking on the responsibility of the tree-top living Australian creature and know what they are getting into, especially when it comes to feeding them. The name “sugar glider” comes from their diet of sweet sap and nectar and from their flap of skin from their ankles and wrists that lets them glide. As social creatures (to the point that they could die without it), sugar gliders are said to be endearing and playful as pets that do better in pairs and colonies. Letting a sugar glider ride in your pocket during the day can easily allow you to bond with them, and they can live from 12 to 14 years in domesticity. House training is said to be difficult, as their claws and teeth are sharp, and they will bite if they feel scared or threatened. If your sugar glider isn’t tamed when acquired, patience, time, care, and training sessions will eventually let the glider bond with its owner—punishment doesn’t tend to work with gliders, so try for reinforcement instead. 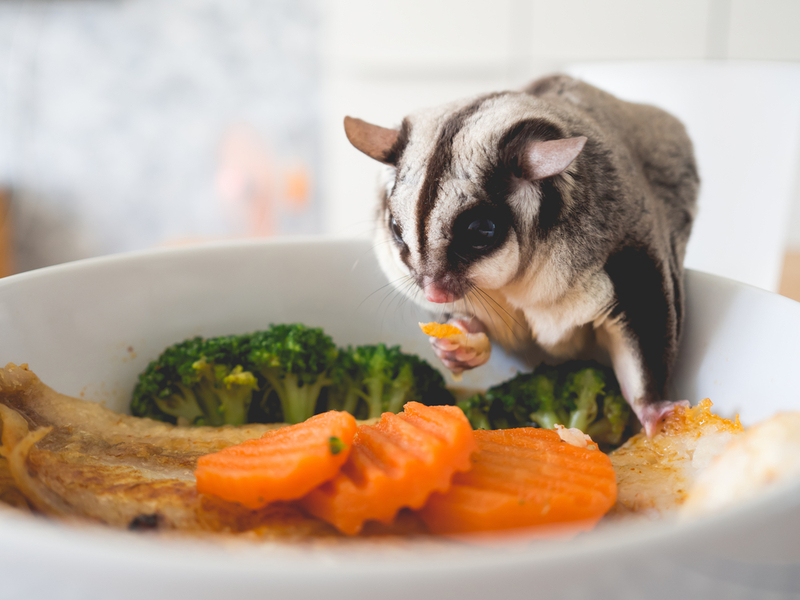 Being a relatively new addition to the pet market, the sugar glider’s diet is a confusing, more unknown subject, and it can vary significantly depending on your source. Their health requirements are, of course, of paramount importance, especially since they can acquire metabolic bone diseases, which happens due to improper proportions of phosphorous and calcium. When a sugar glider’s diet has less calcium than phosphorous, calcium is leached from their bones and tissues so their blood levels can balance. This leads to bone-softening, leaving gliders more susceptible to bone fractures and other calcium imbalance-related problems. As omnivores, wild sugar gliders feed on both meat and plant material, including sap, fruit, nectar, honeydew, bird eggs, small birds, lizards, or small rodents. This diet, however, is hard to duplicate for captivity. For a sugar glider to prosper in captivity, professionals in the field suggest an extensive variety in food to copy its natural diet. 1 tablespoon of insects or store-bought insectivore diet. For insects, focus on variety (moths, meal worms, spiders, wax worms, crickets, etc.). Feed the insects quality food, such as marketplace cricket food, ​brushed with a mineral/vitamin supplement. Mix the water and Manuka honey. Blend the egg and then gradually include the water/Manuka honey mixture. Blend in the vitamin supplement until it is smooth, mixing in the cereal until the mixture is smooth again. Keep the mixture refrigerated until you serve it. Again, feeding recommendations can greatly vary, but important considerations include maintaining the right phosphorus/calcium ratio (2-1:1 phosphorus to calcium), and avoiding refined sugars and fats. If you want to change your sugar glider’s diet, do so gradually and ensure the glider does not become distressed by the change and is adjusting to its new diet. Avoid chocolate in the glider’s diet as if it were a dog because it is just as toxic.